The Mercy James Institute of Pediatric Surgery and Intensive Care (MJC), a state-of-the-art pediatric surgery and intensive care unit at Queen Elizabeth Central Hospital in Malawi’s commercial capital of Blantyre, is but one of the many places where Kelfoods makes a real difference to the daily lives of the people of Malawi. This institute was developed by Raising Malawi, a non-government organisation, founded by the iconic superstar, Madonna, in collaboration with the Malawian health ministry. Second to Madonna, Kelfoods made the largest contribution to the investment of the hospital. We are still involved and support the children by supplying eggs to the hospital. The MJC formally opened on July 11, 2017 by his excellency President Arthur Peter Mutharika and Madonna. Called the “pride of Malawi” by His Excellency, the opening ceremony was a celebration of the partnership between Raising Malawi, the Malawian Ministry of Health and a coalition of global and local partners like Kelfoods. The MJC was named after the adopted daughter of Madonna who was born in Malawi. Prior to the opening of the MJIPSIC, the Queen Elisabeth Central Hospital had less than five intensive care beds. The entire country of 17 million people, of whom 15 percent were less that 15 years of age, had less than five pediatric surgeons. The nation had a great shortage of medical manpower, basically one surgeon per one million people. The new institute addresses both those problems as it also serves as a teaching facility for Malawian pediatric surgeons. With three operating theatres, Malawi’s first and only paediatric intensive care unit and a 50-bed ward, the facility is already making a significant difference in the lives of Malawian children. 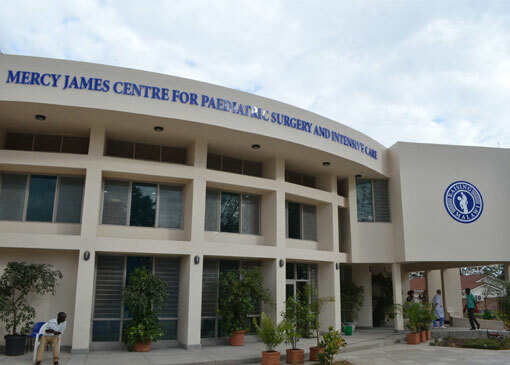 The Mercy James Institute for Pediatric Surgery and Intensive Care , also Mercy James Pediatric Hospital, , is a specialised children’s hospital in Malawi with a fully equipped pediatric surgery and intensive care unit located within the Queen Elizabeth Central Hospital in Blantyre. Prior to the opening of the hospital, the Queen Elisabeth Central Hospital had less than five intensive care beds. The entire country of 17 million people, of whom 15 percent were aged less than 15 years, had less than five pediatric surgeons. The new institute addresses both those problems. With three operating theatres, Malawi’s first and only paediatric intensive care unit and a 50-bed ward, the facility is already making a significant difference in the lives of Malawian children. The hospital is also a training center of excellence for Southern Africa, with more local doctors acquiring the skills needed to perform pediatric surgery and serve the 50% of Malawians who are under 15 years old.